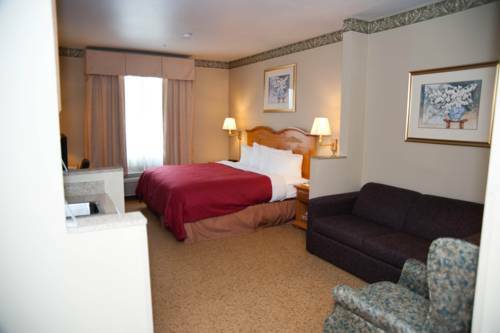 The Country Inn & Suites By Radisson, Austin-University, TX is conveniently located near downtown, UT Austin, 6th Street Entertainment District, the Convention Center, the Expo Center, and the State Capital. After a hard day working or sightseeing, unwind at the hotel's beautiful and quiet outdoor pool. A fitness room, open 24 hours, is also available to help you stay in shape when you are away from home. The hotel offers a complimentary hot breakfast and is also adjacent to several major restaurants including Applebee's which will deliver to the hotel for free. Antonio's TexMex: One block from the hotel. Features live music nightly. Bennigan's: One block from the hotel. Free delivery to the hotel. Chili's Grill and Bar: Located 1/2 mile from the hotel. Pappadeaux Seafood Kitchen: Located 1 mile from the hotel. TGI Friday's: Located 4 miles from the hotel. Denny's: Located 2 blocks from the hotel. Iron Works BBQ: Located 4 miles from the hotel. PF Chang's: Located 4 miles from the hotel. Breakfast Room: Located in Hotel Lobby. First Floor Meeting Space: 744 square feet of flexible meeting space that can accommodate up to 60 people is offered at the facility. Arrangements can be made for necessary equipment and catering needs. Wireless high speed cable internet access is available in meeting rooms. Largest Urban Bat Colony in USClouds of Mexican freetail bats flyout after sunset. Texas State CapitalHistoric and architecturally unique. Barton Springs PoolFavorite local swimming for 10,000 years - 68F all year. Mt Bonnell99 steps to enjoy breathtaking panoramic view of city skyline. Recreational Activities at Town LakeWalk, Jog or Bicycle around the gorgeous trail. Lady Bird Lake River Boat CruisesCanoeing, Sculling or Paddle Boating also available. Govenor's Mansion TourResidence of every Texas Governor since 1856. Horse Race at Manor Downs. Blues Music ClubsWhy Austin is known as "Home of the Blues"
Darrell K Royal - Texas Memorial StadiumThere's no bigger show in town than Texas Memorial Stadium on a fall Saturday. Dave & BustersThis popular sports bar is also the official post-game gathering place for Austin's Round Rock Express baseball team. The DomainVisit the Domain lifestyle center to browse luxury shops like Louis Vuitton, Neiman Marcus and Tiffany & Co.
Palmer Events CenterThis exhibition center includes an illuminated water fountain and an observation hill overlooking beautiful Lady Bird Lake. Round Rock Express Baseball ClubHead to the Dell Diamond and cheer on Austin's beloved AAA baseball affiliate of the Houston Astros. Travis County Exposition CenterThis multipurpose facility occupies 128 acres and hosts everything from dog shows to the Star of Texas Fair and Rodeo.